The new cafe and community space is scheduled to open on Monday, Aug. 13. 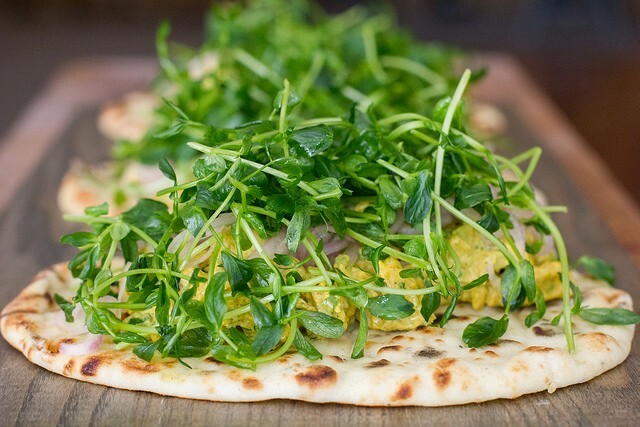 Naan topped with curry chicken salad and arugula. The Alice Collective is much in line with what’s happening with a lot of food spaces in the East Bay: a food incubator mentality with a shared sense of community, where locally owned food businesses can get a leg up and thrive. The new, downtown Oakland cafe and community space (272 14th St.) is scheduled to officially open on Monday, Aug. 13. Ted Wilson, founder of The Hall in San Francisco and cofounder of Metal & Match Catering, is bringing a similar sensibility to the new Oakland venture. The upstairs cafe will be open to the public, while the large commercial kitchen in the basement will house local food businesses. The upstairs cafe, which is about 3,600 square feet, will feature sandwiches, pastries from Oak & Fig Baking, and a full coffee bar from Red Bay Coffee. There is also an 800-square-foot patio space with a bamboo grove and birds of paradise. The cafe will be open weekdays during breakfast and lunch. In the evenings, the space will be available for events. Christine Wells, who cofounded Metal & Match with Wilson, will oversee the food program as the Alice Collective’s executive chef. “We’re looking to bring in fresh and clean flavors — simple, California fresh food — to that area.” This might mean sandwiches with arugula salad or grilled naan with curry chicken salad. 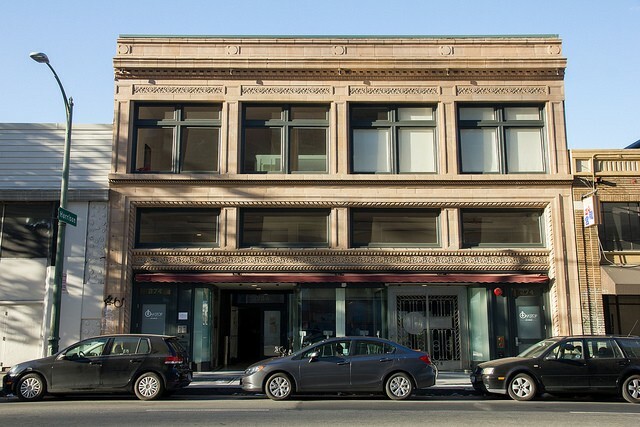 The historic downtown Oakland building has been well-restored. The basement includes Andrew Lawrence Schiff of Oak & Fig Baking, who was previously sharing kitchen space at Forage Kitchen. Metal & Match also operates downstairs, and the collective is hoping to bring another local tenant in soon. During the evenings and weekends, the space will be available for private events. Veteran bartender Nancy Chung, who owns The Wooden Nickel in San Francisco, has been tapped as beverage director of the venue. Wilson said he was approached by the owner of the building because of the work he’d done at The Hall, which was a gourmet food court, bar, and community space that closed last year. “I just looked in here and said, ‘People need to be in here,’” he said.